Troy is one of the three major cities in the state’s Capital District, located on the Hudson river with close ties to Albany and Schenectady. 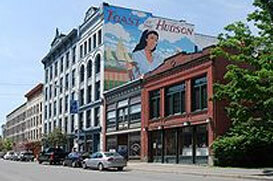 In recent years, Troy has been blessed with an amazing initiative to restore the small city to its original beauty. There are are fairly distinct sections of the city: Downtown, the Hill, Albia, Sycaway, South Troy and North Troy. The city is beautiful, diverse, and rich in history. Troy boasts several events for its community members every year. The Victorian Stroll is a traditional holiday event that transforms the streets of downtown Troy into a historical “magical stage” every December! The first Friday of every month is Troy Night Out where downtown businesses open their doors and provide activities for visitors. These often include fine and casual dining experiences and art and gallery related activities at the Arts Center of the Capital Region, located on River Street. Troy Night Out draws in students from both colleges and locals from the surrounding areas. Each TNO has a theme, and the local shops will decorate their storefronts, hold contests and even give special deals. Rockin’ on the River is a relatively new event to attend in the summer months. This is a free, outdoor concert series that gives neighbors a chance to enjoy the shops, markets and eateries that downtown Troy has to offer. The Troy Waterfront Market is a year round market found in downtown Troy. Each Saturday, the streets just off the Hudson River are blocked off, and the vendors come out for the weekly farmer’s market. It is the most popular farmer’s market in the Capital Region and has recently launched a twilight market. Potentially the largest outdoor market in the Capital Region, there’s the usual line of crafters, local produce vendors, cold-pressed juice and food trucks. 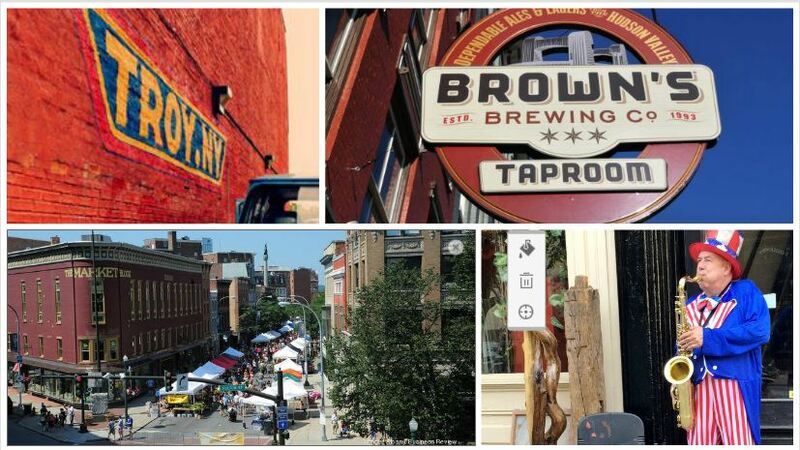 Also located in Troy is Brown’s Brewing Co. Upstate New York is the Napa Valley of microbreweries and beer, and Troy is no exception. Since 1993, Brown’s Brewing Company has been pumping out locally sourced, house made beers with seasonal varieties and distributing it to the masses. Not only does the brewery provide a great boost to the economy, but locals can enjoy the craft beers with their pub food. A great place to relax, Brown’s is warm and welcoming to all people. Troy is home to several colleges including Rensselaer Polytechnic Institute (RPI), Hudson Valley Community College (the primary community college for the Capital Region) and Russell Sage College. It also houses private school Emma Willard. Troy is also home to the Children’s Museum of Science and Technology (CMOST) where children and parents can “Explore, Discover, and Imagine” the world of science together. Joseph L. Bruno Stadium is where the Tri-City ValleyCats have call home. “The Joe” is active from June through September. Every night at “The Joe” features affordable family fun.